This is my first Christmas season in the US in 4 years. It feels a bit overwhelming to have the holiday season in America on full-blast. I actually prefer to be in the Middle East -- no news flash there. The memories of Middle East Christmases past flood my mind as I write this. There is something special about celebrating this season with other Christians from different countries, especially Arab Christians. I also have special, treasured memories of Christmases spent with Muslims as well. All of which are mashing together in my mind and heart. The years of a special carol service at little tiny Anglican church in Beirut remain as my all-time favorite church service in the world. Candlelight service, beautiful readings and songs, mulled wine and minced pies, and fellowship with a cast of characters; it had a very British feel. A close second is the midnight Christmas Eve service at the little church whose congregation is a throng of Arabs and expats. That community was a lifeline for me in Beirut. 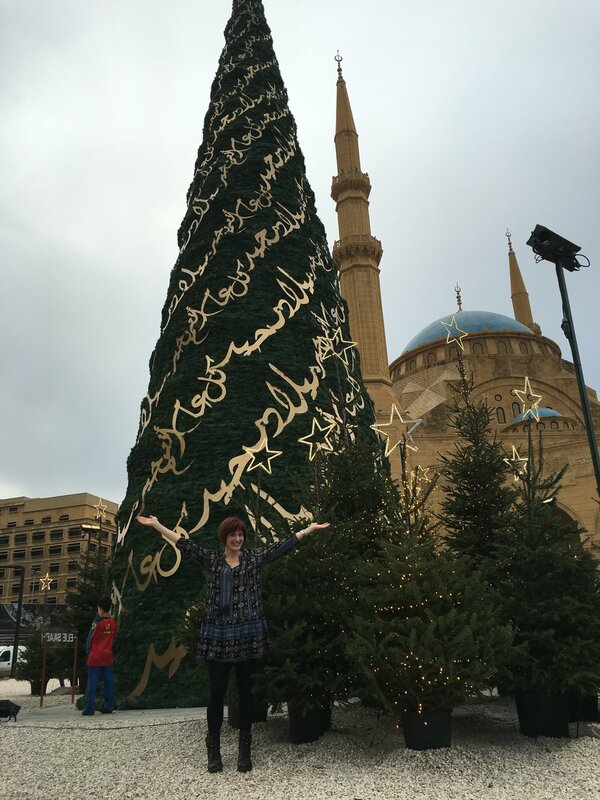 Lebanese Christians celebrate with Christmas trees, presents, turkey, chestnuts (they really roast chestnuts!) and buche de noel (chocolate log cake). Jordanian Christians make homemade wine to give as gifts. Yup, Jordanian grandmas are making hooch in their kitchens. ‘Tis the season! What I was most shocked by, in both Lebanon and Jordan, were the Christmas decorations everywhere, including Muslim areas. Lights, wreaths, trees, & Baba Noel. Baba Noel is the very French version of Santa Claus in Lebanon — he’s even at the malls in Beirut! Christmas trees and decorations flood the stores in Amman as well; I’ve even seen a hajji (older, covered woman) toss a plastic Christmas tree over her shoulder and carry it down the street and assumed she was taking it home. 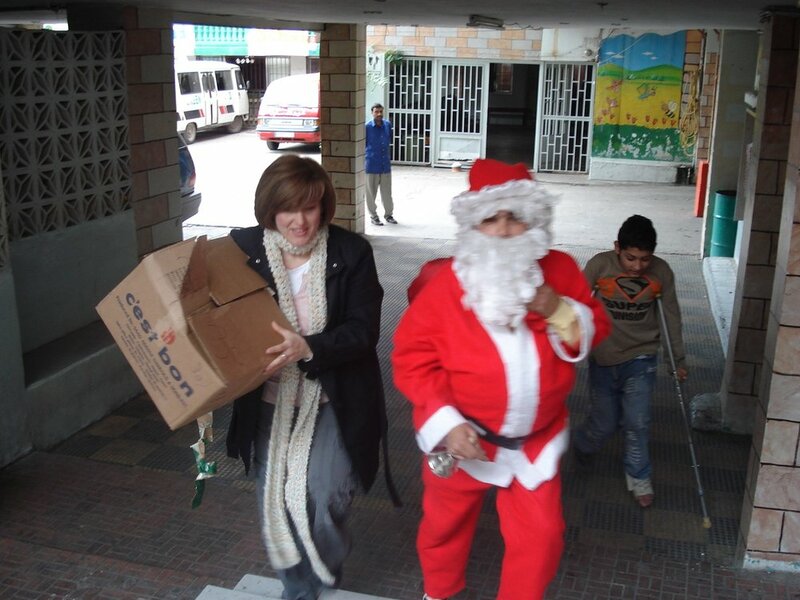 For years, at the center I worked at near Bourj Al-Barajneh Palestinian refugee camp, we brought Baba Noel to many of the pre-schools in and near the camp. One of my favorite memories is being in a van weaving through the tangled, crowded, narrow streets of a neighborhood controlled by a Lebanese militia. The van was full of my Palestinian refugee co-workers -- one of whom was dressed up as Baba Noel -- and a few assorted foreigners (including yours truly) just to add to the mix. We were quite a spectacle. So much so that grown men on the street saw us and started to laugh and wave as we drove past. So many memories of Lebanese and Palestinian children in Santa hats, gifts, candy, games, music, dancing, and such, such joy. So, even though Christmas is a Christian holiday, I do remember how people welcomed that season of giving. I’ve been to Christmas parties in both Lebanon and Jordan with my Muslim friends. I have also received many “Yinad Aleiki” and “Happy Christmas” greetings from Muslim friends and strangers alike over the many Christmases I’ve spent in the Middle East. The hospitality and honor I was shown was extraordinary. Her mom had never eaten turkey before, let alone cooked one, but she knew that’s what Lebanese Christians have for Christmas. She ordered one from a caterer, complete with rice and chestnuts. She made a feast to accompany it, as she always did. And she knew my Lebanese favorites -- tabbouleh, fatteh, kibbeh. Many other dishes were spread around the table, encircling that beautiful bird. After the meal, my friend’s sister-in-law gave me a gift; she said, “It’s Christmas, you should have a present.” It was olive oil soap from her hometown of Saida — they are famous for it. They asked me how my family celebrates Christmas and what it means to me as Christian. I stayed for hours; we lingered over coffee and sweets and conversation after the meal. It really was my best Christmas because of the love and care I received from a family that honored me and my faith. I got to share a special holiday with them. It’s humbling, giving and receiving. I really have no words even as I write this: to have such dear friends from another religion take such sweet care of you and honor you and your holidays…. Those experiences are based on relationship -- based on people who know me well. I don’t want to give you the wrong impression -- not all Muslims celebrate Christmas; actually, most do not. But again, from my years in the Middle East, some participate to honor me and some have a fondness for the season because of the beauty and jaww (vibe, atmosphere). I’ve also witnessed conversations of some who are more conservative debate if it’s permissible in Islam to wish Christians a Merry Christmas. There is a broad spectrum, and I have encountered a lot of different reactions in the Middle East. Why did I tell you all my Middle East Christmas stories? Aside from recalling fond memories and making me a little homesick for the Middle East? I have been deeply disturbed by how many people view Muslims in the Middle East. Deeply disheartened by the stereotypes and untruths of a people most have never personally encountered. In my opinion, formed over 18 years of cross-cultural work, it takes strength of character, security in one’s own spirituality or path of faith, authenticity, and tenderness to be able reach out in love and respect to those of another faith. The key to all of these stories is relationship. It can be scary and it puts you out of your comfort zone, but the reward is priceless. Relationship is everything. I remember, years ago, on a trip to Africa, having a thought that changed how I look at people. It flashed through my head and seared my heart. You can call it intuition or that the Divine was speaking to my heart. If each human being is created in the image of God, then I have a choice of reflecting that back to them or not. Authentically, that can only be done in relationship -- mutual, reciprocal, equal. You might be surprised at who you find kinship with. Emmanuel might be my favorite word -- “God with us.” This time of year, we remember that our God came to us in the form of a helpless baby. To be with us. The witnesses of his birth to a couple fleeing religious oppression (aka, refugees) were the poor, foreigners, and stable animals. The pious religious folks weren’t there. The outcasts were. This is who God revealed himself to in the most vulnerable form of a baby. Those you might have stereotypes about or think aren’t worthy…might just be in the center of God’s all-consuming, all-including love. Standing on the outskirts, on the edge, with those who don’t fit, because there is no one outside of his love. That is the true beauty of the Christmas story.